The Day AFTER St. Patrick’s Day, 2010. 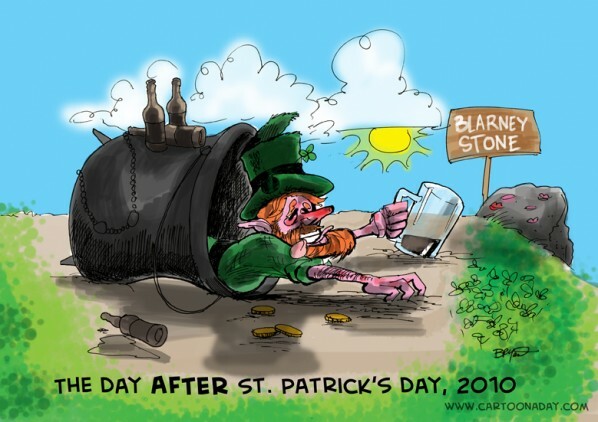 Hopefully the cartoon says it all…but if not, it’s a leprechaun the morning after St. Patrick’s Day 2010, and an empty pot of gold. Sadly, I don’t see a rainbow. A drunken leprechaun crawls from an empty pot of gold after St. Patrick's Day. His gold is gone and he looks in bad shape. Inspiration: Inspired by St. Patrick's Day 2010, leprechauns, pots of gold and too much partying.